Beef Strogonoff is so much more than the 50s and 60s made it out to be. 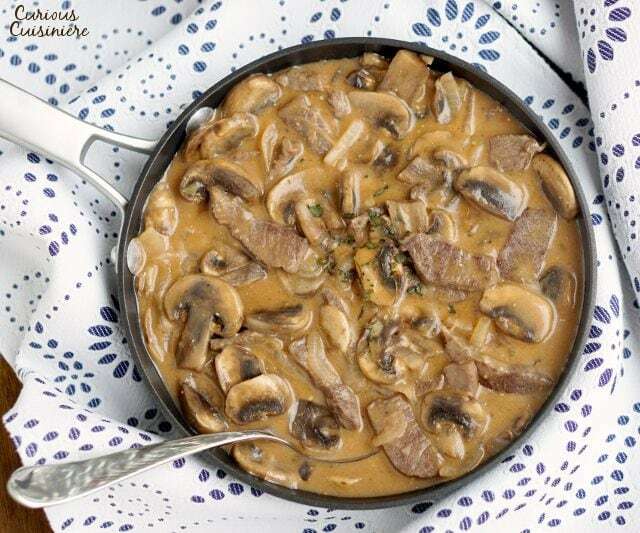 Our easy and authentic Russian Beef Stroganoff recipe combines tender beef and flavorful mushrooms in a creamy sauce for an elegant, yet quick dish. Strogonoff (or Stroganov) is a simple and comforting Russian dish consisting of sauteed pieces of beef served in a sour cream sauce. It dates back to the mid 19th century, and is named for a member of the Stroganov family, who were a group of highly successful Russian merchants and landowners: the richest businessmen in Tsarist Russia. The first known recipe shows up in the mid 1800s in a Russian cookbook. After the fall of Tsarist Russia, the dish found popularity in China. Then, during WWII, Russian and Chinese immigrants as well as US servicemen brought the dish to the US. 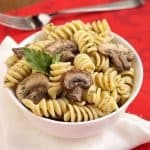 In the 50s and 60s, Stroganoff saw quite a bit of popularity in the US, but overtime its image was marred by canned cream of mushroom soup and poor cuts of meat that were slopped over noodles or rice and served in school cafeterias. It saw so much popularity, it really became an iconic dish. Unfortunately, it was this cafeteria version that everyone in the States came to associate with the name. If you’ve been scared off by bad cafeteria versions of beef sreoganoff, now is the time to give it another chance. 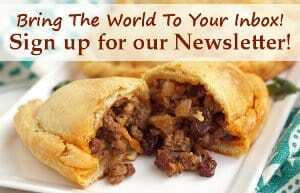 What Cut Of Beef To Use In Beef Stroganoff? 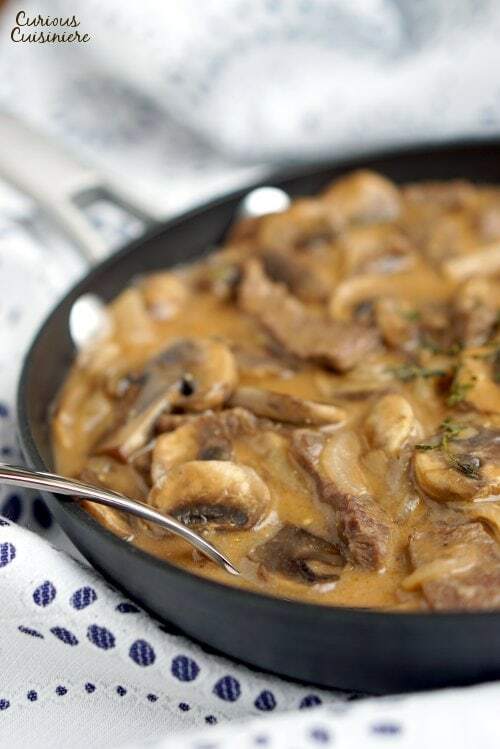 The best beef to use in beef stroganoff is a cut that works well with quick cooking. That means you need something that is fairly tender in its own right. We like to use a sirloin steak, but flank steak is another good option. The important thing is to cut the steak into thin slices, or chunks, by cutting across the grain. This shortens the fibers of the meat, making it more tender with less cooking. 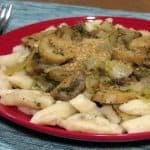 The first time we made homemade stroganoff, as we sat down to dinner, we were a bit in disbelief at what was sitting in front of us. An elegant version of beef stroganoff? This dish is hearty and full of flavor. 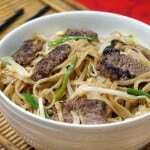 With chunks of beef and ample, tender mushrooms. And, it’s quite easy to make! We saute our mushrooms first and then remove them from the pan. This is an extra step, but it really does wonders to create different elements in the dish, rather than having everything taste the same. After the mushrooms, it’s time for the onions and beef to be sauteed. Then, it’s time to make the gravy with beef broth and seasonings. Sour cream gets stirred in at the end to thicken the sauce and make it extra creamy! In less than 30 minutes, you have an incredibly comforting dish that can be served with a number of accompaniments. In Russia, you will most often find traditional beef stroganoff served over fried shoestring potatoes (French fries). It can also be found served over mashed potatoes or rice. 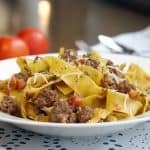 Here in the States, pasta is the most common accompaniment to beef stroganoff, particularly twisted egg noodles. Whichever way you go, having something to soak up the delicious gravy is a must! And, while not culturally appropriate, this dish pairs perfectly with a Bordeaux-style wine. 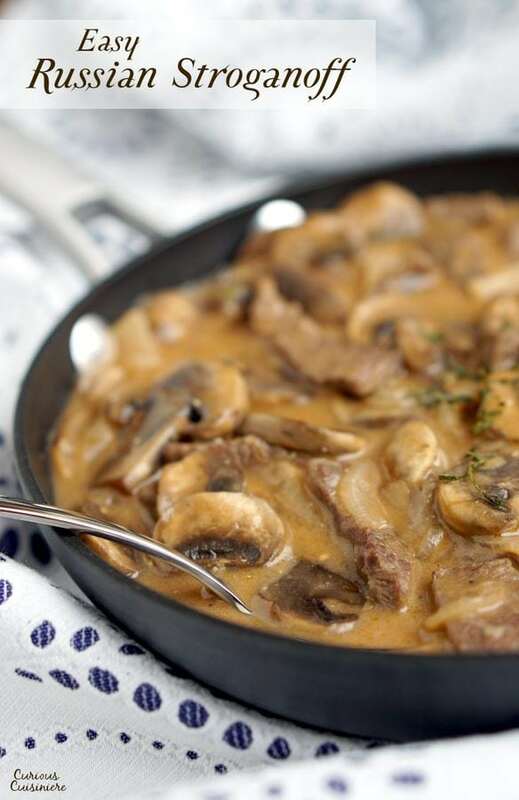 Our easy and authentic Russian Beef Stroganoff recipe combines tender beef and flavorful mushrooms in a creamy sauce for an elegant, yet quick dish. In a large skillet, heat 1 Tbsp of butter. Saute the mushrooms in the butter over medium high heat for 2 minutes. Remove the mushrooms from the pan and set aside. Add the remaining 1 Tbsp butter to the pan and heat until melted. Add the onions to the butter and saute for 1-2 minutes. Toss the beef chunks with the flour and add them to the saute pan. Cook until browned, 2-3 minutes. Add the beef broth, mustard powder, and tomato paste to the saute pan along with the cooked mushrooms, scraping the bottom of the pan to pick up any stuck bits. Simmer the mixture over medium heat for 10-15 minutes, until the beef is cooked to your liking. Place the sour cream into a small bowl and mix a little of the broth from the skillet with the sour cream to warm it. Pour the warmed sour cream mixture into the saucepan and mix to combine. Taste the stroganoff and add the salt and pepper, to taste. 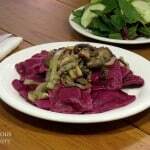 Serve the stroganoff along side of potatoes, rice, or noodles, of your choosing. 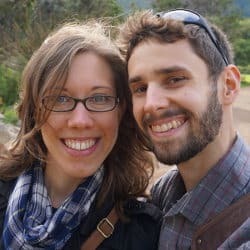 This recipe from 2015 was updated in April 2017. We made the stroganoff easier and more authentic. Enjoy! I, too, have looked for a recipe close to the amazing dish I ate in Kemerovo, Russia over 10 years ago at a cute restaurant just down from our hotel. I agree; this is the closest I have ever come to replicating it. As we ate it tonight I shared the story of going back to that restaurant several times just for the stroganoff with my daughter (who we adopted from Russia). I think the more I make it, the better I will be at it! Thank you so much for the recipe and bringing back memories of a special time! Hi Paige. Thank you so much for sharing your memories with us! We’re so glad you and your family enjoyed the stroganoff! 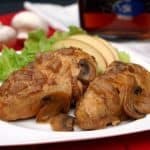 Thank you got sharing this is the closest recipe I recall to my Otec favorite, we ate several times a month very authentic and traditional!!! Dakjuem! You’re welcome! We hope you enjoy it! I love finding authentic original recipes. It is wonderful to find that you have done the research for me! 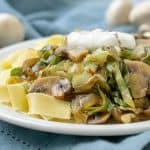 I have a beef Stroganoff recipe that I have used for years and passed on to my kids and was amazed at how close to the original it is. I use just a pinch of dry mustard instead of the seed and never saw that it is traditionally served over fried potatoes. I can’t wrap my head around how that will taste, so I might have to transition into that idea slowly. Tonight, I believe I will serve it with whole new potatoes. Thanks for your note Diane. It’s hard for us to think about serving it over fried potatoes too. (We typically use noodles.) But whole new potatoes does sound like a tasty way to make the transition! Thanks for the idea! I’ve been looking for a recipe to be as good as what I had in a restaurant in a small town in Russia in 1970, on the highway between Minsk and Moscow. It was the most expensive item on the menu, 50 kopecks or half a ruble, when the official exchange rate was $1.11 to the ruble. Black market rate much cheaper! The stroganoff was served with whole new potatoes, and I’ll never forget the wonderful flavor. What great memories! Thanks for sharing! We hope this recipe lives up to your memories! I looked for years for the recipe that my mother made. This was it! The tomato paste was the deciding factor for me to try this one. It was fantastic! Wonderful! 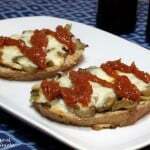 So glad this recipe brought back memories for you! Exactly, that and the mustard seed. Perfect! I have tried roughly ten different recipes, and none come as close to tasting “authentic” as this one. Too often, the resulting taste is overly buttery, salty, and hard on the stomach. But as a person with Russian roots, I can testify that this is as close to my favorite “motherland meal” recipe as you can get! I found myself needing to add more broth, but I used an ‘at-home’ leftover beef broth from a stew that was really thick and hardy and it thickened to almost a paste in no time flat. But just a little more with extra sour cream did the trick. I enjoyed mine over the home-made potato strings 🙂 Great recipe! Thank you Jak! We’re so glad you enjoyed the recipe! So true! It is comfort food at its finest! A well made Beef Stroganoff is a wonderful thing. So pleased you decided to give this old time classic another chance – great choice. 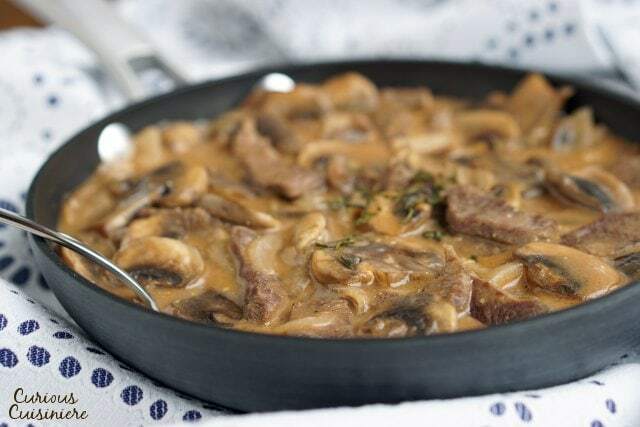 Love Beef Stroganoff, but have yet to make it. Will definitely have to try this recipe. I always love how you often give the background on the dishes you serve. Thank you for your kind words and I love how you lightened the recipe a bit by using broth instead of heavy cream. I am sticking that little bit of knowledge in my back pocket for future reference. A complete classic! In fact, one of my hubby’s favorite dishes, which I make quite often, hard to beat the combination of flavors and it is not that hard to make! Yumm!! I haven’t made stroganoff in way too long – this version looks divine!